The Beaver Section is based around the 'Friends of the Forest' book with the leaders taking their names from characters in the book. "A Beaver is always busy and bright, and helps other people by doing a good turn every day." And to be a good Beaver." 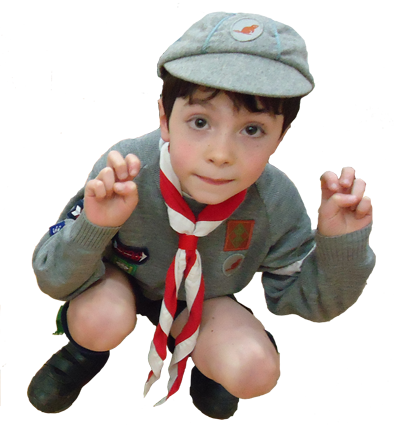 Age:- You can join Beavers in the three months leading up to your 6th birthday and can move to the Cub Pack any time from you 8th birthday, but before you reach 8 ½. This is carried out with the right hand. The thumb holds down the last two fingers across the palm and the other two fingers are bent in from the joints at an angle of about 90 degrees. This represents the two main gnawing teeth of the beaver. The right hand is then used in the same way as the Military salute, i.e. touching the peak of the cap. The fingers are held in the same position as for the Beaver Salute but the hand is held straight up with the elbow touching the side of the body. 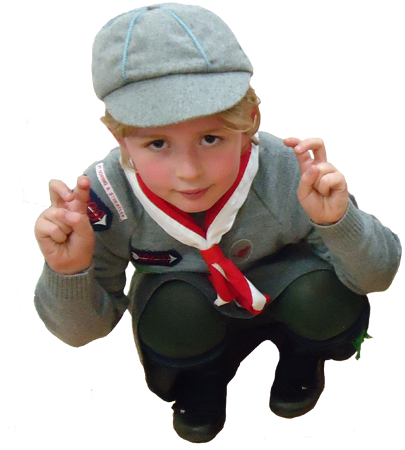 This position is adopted when making the promise at the Beaver's Investiture or when not in full uniform. This should preferably be taken Ahmeek and should be the first event of any Colony Meeting. It should also be the final event of any Colony Meeting after the closing prayer but with the exception of the Dismissal Command. The first command by Ahmeek will be the shout River Banks. At this command the Beavers form two wavy lines, the River Formation, one line facing the other, Beavers facing inwards holding hands. Ahmeek then calls out the command Build the Dam and the Beavers close the ends of the lines furthest away from Ahmeek to form a Horseshoe configeration with Ahmeek in the open part. Ahmeek stretches out his/her arms sideways and then drops the arms. The Beavers go into the Chopping Position with feet on the floor, body in a crouching position, elbows on knees, forearms straight up and both hands in the Beaver Sign position. This represents the Beavers' paws on the trunk of a tree. Ahmeek then asks the Beavers, Who are you and what do you do? and the Beavers reply, Beavers, Beavers, Beavers, Sharing, Sharing, Sharing. Then, starting from a quiet whisper, rising to a shout, the Beavers say, SH-SH-SH-SH-ISS and jump up, at the same time clapping their hands together behind them. This represents the sound of the waterswishing as the Beavers come up to break the surface of the pond, the clapping is the beavers' tails splashing or flapping in the water to rise to the surface of the pond. 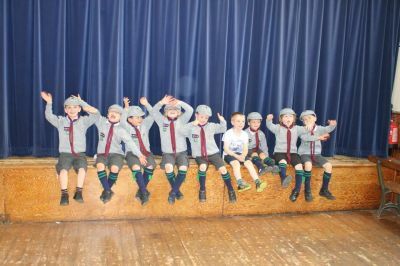 As with the other Scouting Sections it is advisable to only allow Invested Beavers to take part in the Tail Slap, apart from those new Beavers who are learning what the ceremony is all about. New Beavers will be taught the Tail Slap individually and not in the Colony Dam formation. Kitten (Or Kit) is the name given to a new Beaver. At the first Colony Meeting the Kitten is placed in a Lodge, preferably with someone who is a friend. The Kitten may wear all the Beaver uniform with the exception of the badges. In order to be Invested the Kitten must pass the tests as detailed in the Beaver Training Scheme. Ahmeek will take the Investiture and this should be held at the beginning of a Colony Meeting with parents invited to come along and watch. As the Colony is in the Dam formation, Ahmeek will ask the Lodge Leader that the Beaver is in, to bring the Kitten forward to be invested. The Kitten then makes the Beaver Sign and repeats the Beaver Promise, first having given the Beaver Law. 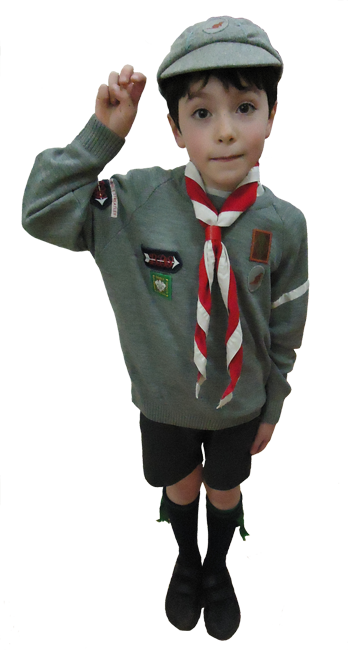 The new Beaver is then presented with the Investiture Badges and Group neckerchief and welcomed into the Worldwide Brotherhood of Scouting. The new Beaver then Salutes Ahmeek and turns to salute the Colony who all return the Salute. The new Beaver is then clapped back to his Beaver Lodge. This is the ultimate ceremony in the Colony for the Beaver, who should have now achieved the Swimming Up Badge, as this marks the departure for pastures new and further great adventures in the Wolf Cub Pack. This is therefore a joint ceremony between Ahmeek and Akela who must work together to make it a success. Before moving finally into the Wolf Cub Pack, the Beaver will have been to a Pack Meeting to meet the Old Wolves (the leaders) and the Beaver's prospective Wolf Cub Sixer. The Colony is in the Dam formation and the Wolf Cub Pack in the Pack Circle/Council Rock formation. The open ends of both the Colony and the Pack will face one another. The Beaver to Swim Up will face Ahmeek in the centre of the Dam formation and the Beavers will do the Tail Slap. The Beaver concerned will then go around the Colony and shake hands for the last time as a Beaver. 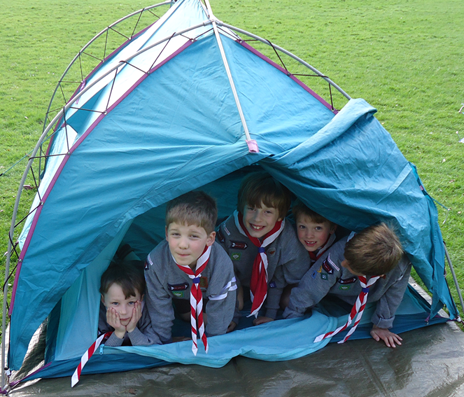 The Beavers are then told by Ahmeek Beavers Make The Lodge. The Lodge is made by all the Beavers gather around the Beaver who is leaving, in a closed circle with hands up stretched and swaying gently to form a roof, the Beaver concerned then changes from a Beaver jersey and cap into a Wolf Cub jersey and cap to resemble the story in the book Friends of the Forest where the Beaver changes into a Wolf Cub. The new Wolf Cub crawls out of the lodge and is meet by Akela who welcomes them into the Wolf Cub Pack. 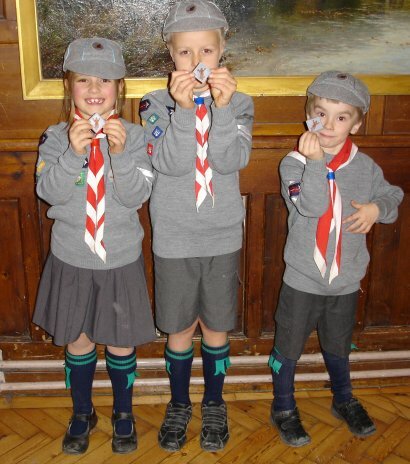 The Beavers then return to their Lodges and the new Wolf Cub joins his new Wolf Cub Six. If desired, Akela may organise a joint game for both the Colony and Pack, before the Pack Meeting start or the Beavers leave for home. This emphasises the fact that the Beaver Swimming Up is not leaving altogether, only moving upwards towards the goal of all Scouts, to be a good citizen.